On 16th May 2015, Sagar Shejwal, a young nursing student, in temple town Shirdi, Maharastra, was beaten to death for keeping Bhimrao Amedhkar song as ringtone, Chandra Sekar Azad ‘Ravan’ has been charged with sedition charges for wrong reasons while the real reason was that he has started a social solidarity action group called Bhim Army in the name of Bhim Rao Amedhkar. If we put these two cases into proper perspective, we understand that while the Sagar’s killing was to do with existing anti-Ambedkar sentiments among the general caste hindus in the country, the Chandrasekar case is to do with anti-Ambedkar sentiments among the caste Hindus such as politicians, bureaucrats and intellectuals at the helm of the affairs. The general caste Hindu society, dominantly rural and with equal participation of the urban as well, with its strong adherence to the social order would see Ambedkar as an eternal enemy as he rejected Hinduism and laid the rational critique on the foundations of the Hinduism. This portion of society would know very little about Ambedkar expect that he was reason for both reservation and anti-Hindu attitudes among dalits. 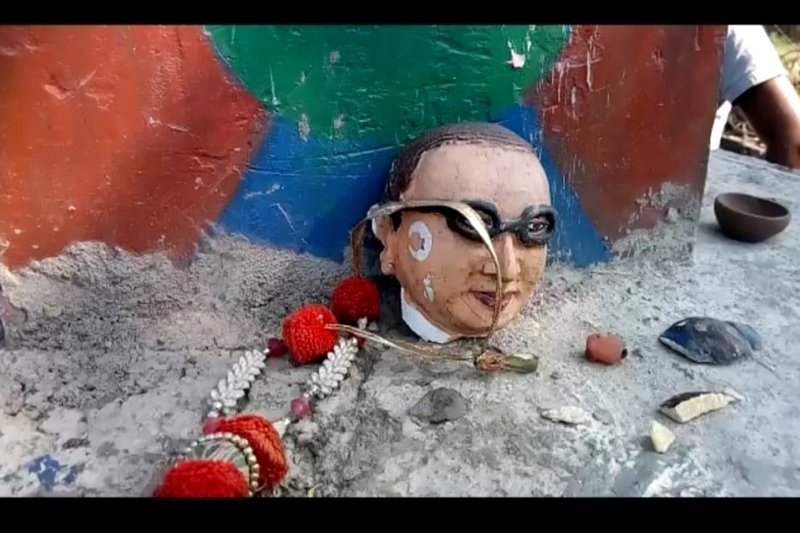 Ambedkar is continuously disrespecting by garlanding with slippers, defacing, blackening and destroying his statues both in rural in urban areas. Among the statues of the builders of modern India, perhaps, Ambedkar’s is the only one which has to be cased to protect it from the so called miscreants. Similarly, the conscious anti-Ambedkar society i.e. caste Hindus in the corridors of power though understands Ambedkar very well, they still treat him as an enemy because he was responsible for creating class of assertive and revolutionary dalits who have been consistently questioning the discrimination of dalits, ill-treatment, monopoly of power and economy by the non-dalits and entering of dalits into hitherto monopolised spheres of power and social prestige. Therefore, this class of metropolitan caste Hindus devise and design methods and strategies to keep dalits (or ambedkarites) at bay. In general the Hindu society which would not be conformable in Ambedkar becoming source of inspiration to dalits in developing social solidarity (self-help) formations which might, according to caste Hindus, pose challenge to the well established social, cultural, economic and political superstructures. Therefore, Sagar’s death signifies how the caste Hindu youth was angered over ringtone on Amedhkar in a cell phone. For a caste Hindu, a Hindu dalit, should have kept a slokam or a song on any Hindu God/Goddess or a popular Bollywood film song as ringtone as caste Hindus do. Ringtone on Ambedkar, perhaps, for their understanding, elevated Ambedkar to the status of God or a hero. It also meant that Sagar using it in his phone presented Ambedkar as a fast growing inspirational figure among dalit youth which might pose a serious challenge to the caste Hindu in the future. This attack also reminds dalits that no matter what they are today and what is Ambedkar for them, they both are untouchables and they must know in a caste Hindu dominated society what they must not do. Here Sagar and Ambedkar were treated with same contempt. I don’t see any difference between these two. Despite being a dalit, had Sagar kept a song on Hindu God as ringtone, he would not have got killed. Therefore, problem is not Sagar but Ambedkar. So, while Sagar’s killing is a response of the caste Hindu youth against the emergence of Ambedkar as force of inspiration (inspirational Ambedkar), Azad Ravan’s incarceration is response to Ambedkar becoming a powerful source of assertion (assertive and revolutionary Ambedkar). Allowing both these forms of Ambedkar would eventually shake the foundations of the caste system, reverse social and economic positions and put an end to the idea of Hindurastra. Therefore, though, we fail to see, in reality anti-ambedkarism is in existence in every sphere of Indian society. This is not just a by-product of a response from the caste Hindus against dalits challenging the essential socio-religious superstructures but an amalgamation of anti-dalit ideologies existing in small village to parliament intended to control the raise of dalits as formidable social and political force. Methods of problematisation/untouchablisation of Ambedkar/ambedkarites may not be visible to naked eyes. But for dalits through whom this process as executed, it is an everyday experience and for the caste Hindu discriminators of dalits, it provides animalistic psychological satisfaction. They feel proud of devising and designing methods of problematisation. These notorious strategies of caste Hindus as politicians, policy makers, bureaucrats, intellectuals and even so called progressive reformers designed to cleverly camouflage through manipulation and misinterpretation of law and procedures as they are makers and implementers of those laws. It is this control over and accessibility to law that is facilitating the problematisation of dalits as trouble makers, social nuisances, don’t deserve to be, parasites, anti-social elements and even Maoists. Bhrip Bahujan Mahasangh leader, Prakash Amedhkar, criticising the Maharatra Government’s raids on Kabir Kala Munch members, has objected the police connecting Maoism with the dalit movement and said that it was calculated move. The aspirational ambedkarites are to be discriminated, demoted and discouraged and assertive ambedkarites are to be criminalized and dismissed as trouble makers or even be branded as anti-nationals. Ironically, while ambedkarites fighting to ensure the natural and constitutionally endowed human rights of dalits and for the genuine rights of people of general society are treated as criminals, the real anti-nationals who have been consistently working on destroying the social fabric of the nation with no fear of law whatsoever have been given license to be anti-nationals. Actual anti-national is a hero and a genuine leaders and people contributing through their struggles to correct internal inequality and inadequacies are anti-nationals. Azad Ravan is a best example for the latter. Criminalization of ambedkarites is nothing but criminalisation of Ambedkar. Anti-ambedkarism though present everywhere in India, its intensity varies from place to place and sphere to sphere. In urban India, it is quite organized and effective. In rural India it is rude, violent and quite direct. The caste Hindu educated, in urban India, hides their unjustified anger against Ambedkar and dalits as they are aware of any form of open discrimination and ill-treatment of dalit would invite troubles from law. Even if law is not acting on its own against such crimes, it is the case in actuality; the urban organized dalits force the law or order machinery to act. It is this fear of law and organised urban dalits that forces the urban general society to be less discriminative and acts as if they treat Ambedkar and dalits equally. They are either obligated by law or forced by rights conscious dalits. The intellectual caste Hindus existing in bureaucracy, schools, colleges, universities and politics in urban India are much more aggressive and intelligent in suffocating dalits with their clever methods of discrimination. Within urban India, while the metropolitan caste Hindu intellectuals would face immediate resistance to their methods of discrimination from the almost equally intelligent, conscious and assertive metropolitan dalits, in the two-tire and three-tier cities and towns, it is the caste Hindu intelligentsia with the support of caste Hindu bureaucracy succeeds in reducing the influence of Ambedkar on dalits. as part of national historical/social memory, every government office, school, college and university keeps portrait of Ambedkar. His birthday and death anniversary have been celebrated since his death by the nation to recognise his role as a labour minister in the Viceroy’s Executive Council (1942), first law minister in the Nehru cabinet (1946) and as Chairman of the Drafting Committee of the constitution (1950). Many believe that the nation celebrates birthday of Ambedkar and pay respect on his death anniversary as its duty of every citizen to respect him. Yet in actuality, caste Hindu politicians respect him for political reasons, bureaucrats pay respects as a constitutional obligation, intellectuals respect him to present themselves as progressive. In other words, if the civility of the present day society does not force them to respect, they would be interested in throwing away Ambedkar from every place and sphere. In their hearts, they treat him as enemy but for civilisational decency they force themselves to respect him. However, it is not ignore the fact that there are many genuine caste Hindu leaders, intellectuals and bureaucrats who respect him for his wisdom, intellectual calibre, his ideals, commitment to the nation and the service he rendered to the national in multiple ways. Respecting Ambedkar equal to that of any leader from non-dalit background is not normal as the nation believes. For examples, in the sphere of education from primary to the higher, respecting Ambedkar depends upon the head of the institution. If he/she is anti-Ambedkar or anti-dalit in their hearts, Ambedkar would be kept out of the premises of the institutions. As pointed out earlier, this may not be easy in the metropolitan India. But in two and three tire cities and towns, educational institutions are quite successful in eliminating the Ambedkar from the memory of the students, teachers and administrative staff. For caste Hindus, here, the very utterance of the name Ambedkar means anti-establishment, questioning the authority, defaming the institution, creating chaos and troubling non-dalits in the name of discrimination of dalits/ambedkarites. Rights conscious assertive dalits do respond to discrimination and injustice in these spheres. But they are not as strong as metropolitan organised dalits. Isolating, suppressing and psychologically/mentally torturing dalits is quite easy for the administrative establishments. This pushes them into existential crisis. Under these circumstances, dalits remain would calm despite facing direct and indirect discrimination. Their helplessness in fighting against discrimination, forces them to submit to the power of caste Hindus held at various levels. Moreover, since taking inspiration from Ambedkar to fight against caste based discrimination is criminalised, dalits in these institutions would not dare to speak. They either go through the agony and humiliation or breakdown at a certain point in time. Criminalisation of Ambedkar(ites) in these institutions performs functions like it satisfies the inbuilt upper caste psychology that expects the lower caste to be under their control, saves caste Hindus from the law of the land and allows them over take dalits career development. Even the constitutional grievance redressal mechanisms such as Scheduled Caste/ Scheduled Tribe Cells would be made dysfunctional or put under the charge of voiceless incompetent dalit. Similarly, education on Ambedkar, dissemination of Ambedkar ideas, debates and discussion on Ambedkar thought are not encouraged or those who dare to talk about Ambedkar, even an academic discussion needs to think twice before taking such a decision. In other words, in the educational institutions of two and three tire cities and towns, there is an indirect ban on Ambedkar throughout the nation. Not only Ambedkar, even the regional dalit leaders/reformers/literary personalities are not revered and respected. They are not made to part of historical and social memory of the states. But unlike caste Hindus, It is only dalits who, as citizens of nation respects all those leaders who are supposed to be respected by citizens even if they have difference of opinions on some leaders. There are no instances where dalits disrespected any non-dalit leader even if they were considered to be anti-dalits. At the most, they would be critical of them. Therefore, based on the way Ambedkar/ambedkarites treated in this nation, one can say that this nation still treats Ambedkar and his followers as untouchables in every sense of the word.